Call it luck or destiny, but for the Iloilo-based government employee Melen Botin, it’s her faith that brought her to win the brand-new Isuzu mu-X at Lazada’s Online Revolution Sale during the grand raffle draw last January 14. To make the shopping more exciting, Lazada has partnered with Isuzu, to give shoppers a chance to win a brand-new Havana Brown Isuzu mu-X LS-A automatic transmission with Blue Power technology. From millions of users who purchased from Lazada, Botin, a mother from Jaro, Iloilo City, was declared as the grand winner of the Online Revolution Sale. Present during the awarding ceremony were Ray Alimurung, Commercial Business Head for Retail and Brands of Lazada Philippines; Joseph Bautista, Division Head of Marketing Isuzu Philippines Corp., Yasuhiko Oyama, Vice President for Sales Isuzu Phils. Corp.; and Online Revolution grand prize winner Melen Botin. 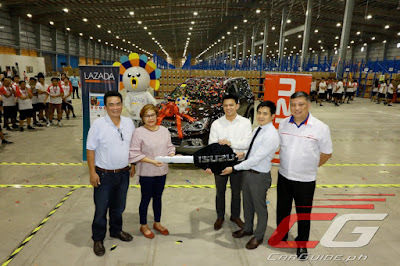 The official turnover of the Isuzu mu-X unit was held at the Lazada warehouse located in Santa Rosa, Laguna on Valentines Day. “We are celebrating with the winner (Botin) as she won the grand prize of Lazada’s Online Revolution. We are happy to partner with Lazada to give their shoppers an opportunity to own their dream vehicle. We are also confident that the Isuzu mu-X will serve as a reliable vehicle,” said Yasuhiko Oyama, Vice President for Sales of Isuzu Philippines Corporation. “More than being the grand winner, it’s the value of the vehicle that’s worth rewarding. The Isuzu mu-X is certainly the perfect SUV that provides great fuel economy, flexibility, and versatility to their family,” he added.